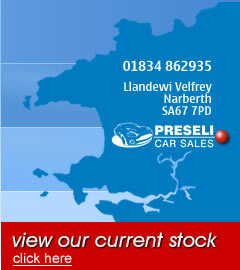 Preseli Car Sales Established January 2008. Preseli Car Sales Is A Local Family Business Based On The Main A40 Trunk Road In The Heart Of Pembrokeshire, West Wales. We Offer A Choice Of Quality Used Vehicles Which Are Locally Sourced And Have Verified Mileage, Service History, HPI Verified Vehicle Condition And Ownership Certificates. The Price range Of Our Vehicles Are From £1,000 To £10,000. We Are A Local Family Business, Where Family Values Count.